Players create a real Ruckus as they race to collect matching cards and hold onto them. Cards are placed on top of matching cards from opponent’s sets then the suit is shouted aloud to win the set. With all players matching, stealing and shouting as fast and loud as they can it’s anyone guess who will get to 77 points first and win the game! The future of gaming is captured in the one-of-a-kind handheld that brings mobile learning and educational gaming to children. Aimed at kids aged between four and nine, Leapster Explorer allows for a truly personalised learning experience with over 35 licensed titles to choose from and an innovative video camera accessory. Get into the fast lane with Fix and Learn Speedy, the learning car that comes complete with interactive tools and songs. By lifting Speedy’s bonnet, toddlers can twist and turn the different shapes and explore counting and alphabet songs designed to tune up their motor skills and fire up imaginations. The Smart-Trike Recliner Stroller is the only trike in the world to support a child from six months to 24 months+, imaginatively growing from a push along recliner to an independent trike. It’s the first tricycle globally to be fully stroller certified! It’s innovative and durable – this trike is built to last! The innovative LeapPad Explorer is a multifunctional learning tablet built just for kids. Encompassing the next generation of learning, digital reading and personal creativity, LeapPad comes with a collection of innovative tools including a built in camera and video recorder that allows children to produce and share their unique creations. 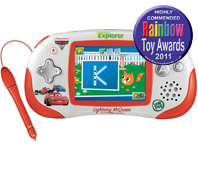 LeapFrog’s limited edition Cars 2 Explorer brings all the gaming fun and educational content of the standard Leapster Explorer with the added excitement of a new twist! Adapting the Explorer’s robust design, children can personalise their play with a signature red case decorated with popular characters from the film. iball3 is a clear ball with an electronic display within. Enabling six lights in a sequence to light up all the same colour with a certain time is the aim and there are two levels of play. Succeed and a code will allow access to interactive parts of the iball3 website. The Duplo Police Station is the hero of the new Police range, with many elements to stimulate hours of play. The set has great authentic details; like a cell for the robber and an office for the constable to file all his reports. The set combines building and role play and will stimulate young imaginations. The Leapster 2 games Console delivers a fun, safe and secure learning experience for children. The handheld comes complete with a preloaded gaming title and an additional download of choice, so that the fun can begin instantly. This cool scooter has an easy to use fold and lock mechanism, adjustable height setting and the light up deck ensures it looks awesome in the dark! It’s great for daytime use with the lights off too as features fantastic graphics. What’s more, the scooter folds away for easy storage. The Clever Box is a creative, innovative and imagination stimulating toy…The pack includes a large and colourful box, which the child cuts and shapes into a creation of their design then using coloured paper, posters and stickers, included in the pack, they decorate to their hearts content. From castles to sweetie shops, theatres to secret dens the only limit is their imagination! PlayMais is a revolutionary craft toy made from 100% natural ingredients and children will have great fun creating all sorts of sculptures and models. One a dab of water is needed to stick the colourful building material together and the 500 piece bucket is sure to inspire heaps of creativity!